Where do you find your reads? 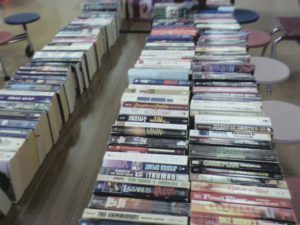 Occasionally in my town, our library has a used book sale to benefit the library so it can purchase more books. Volunteers cover all the tables of the library’s meeting room with every kind of book imaginable (except the ones fit to be covered with discreet brown paper wrappers, I was told). And most of the time I try to remember to show up and support them. As an author, I realize that all these books were once sold brand-new and the author received royalties on that sale. But what about now? They don’t. I also realized as I look at those rows and rows of books that I don’t mind. Of course I’d like to sell a ton of books, but I also realize the value of free (or inexpensive) samples. There’s a population of readers who aren’t “cheap” people, but for whom buying books at full price is a luxury. Part of me can’t begrudge them the experience of getting lost in a story. And truly, what place did we get most of our reading done as kids–and then try to escape from? The library, where we can read for free. Those free or cheap sample books can lead to future sales for those authors whose books covered the tables. The more books I have written and the more books I’ve read, I am quick to recognize the inspirational romance titles scattered throughout the tables for the used book sale. It’s exciting! I’ve even found one or two of my titles there–and I really don’t mind! I look forward to knowing that maybe someone else will pick up one of my books and take it home, even if they only pay 25 cents for it. The town library invited me to be their guest speaker one February for their volunteer appreciation dinner. Let me tell you, library people make authors feel like rock stars. And I owe a lot of my writer’s journey to people like them. So I don’t begrudge them for selling used books, because, like most book lovers, I’m one of the readers stepping up to find a new author myself. Even with the tidal wave of ebooks available online, there’s something special about picking up a “real” printed book and diving into those pages. Do you like to go to used book sales? If so, what new-to-you authors/books have you discovered that you’ve come to enjoy? Lynette Sowell is the award-winning author of over 15 titles for Barbour Publishing, Harlequin, and Abingdon Press. Lynette was born in Western Massachusetts in the shadow of the Berkshire Mountains, raised on the Eastern Shore of Maryland, but makes her home on the doorstep of the Texas hill country. She loves reading, cooking, watching movies, and is always up for a Texas road trip. When she's not writing fiction, she works as a reporter for her city newspaper and has a weekly column called My Front Porch. I agree, Lynette, there’s nothing better than holding a print book. We have a large used book store in our area where I drop off books that I’ve read. I can spend hours browsing. The first Sunday of the month, our town has a great market. There is always a big used book stall that we browse through. I have to confess that my husband and I rather enjoy W E Johns’ Biggles books- my husband read these as a young teen and introduced me to them, bit of fun, light reading. We have found some early editions at the markets. Most of my introduction to authors came from my local library, and now it is through friend and other recommendations. Op shops are also good to check out for books…especially for kids. My kids are currently enjoying Robert Elmer’s Young Underground series- I found one book of the series at a market or op shop and had to go and buy the rest! Lynette, I enjoy browsing our local libraries book sale tables. 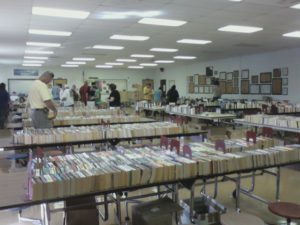 Both local libraries have a huge book sale once a year either early spring or summer. In addition the libraries sell books year around. I enjoy browsing the tables, but usually only buy children’s books for personally use with my grandchildren or to donate for my elementary teacher friends book corner. I am a retired teacher. While I would enjoy buying printed books, in order to have a happy marriage, I now have an extensive ebook collection. Books had literally taken over my house – in every room, in every nook and cranny. I have my print book fix every month when I read the monthly book selection for my Book Club for Foodies: Tales You Can Taste. I am thankful for the generosity of authors, who offer boxed sets, free books, inexpensive books or review copies for their review teams. I was introduced to many a new author in a boxed set. I enjoy writing review and corresponding with authors. Stay cool and best wishes. I understand how books can take over in a house. It’s about time I go through my stacks here and give them away to new homes. I’ve also found some new authors I enjoy via boxed sets. Paper and digital, the best of both worlds. Ha! He finds a chair. I love that. Because it takes time to go through each title one by one. Can’t miss a find!!! We’ve bought several books from a nearby Library from their book sales, many of them contemporary Christian romance novels. Some books we’ve purchased at a Christian bookstore and an outlet store. Since getting Kindles, we’ve purchased several ebooks, some boxed sets and have been introduced to several authors through ebooks. We enjoy reading good wholesome stories that talk about family and faith in Christ. I’m so happy the inspirational market is easier to find! What a wide variety now, too. Much wider than when I first started writing fiction seriously about 17 years ago. We have a fantastic used bookstore that I go to a couple of times a year. I don’t buy many physical books because I am out of space, and e-books are more practical for me. My bookshelf is stacked two or three deep in spots, the top has stacks of books and they are spilling into other areas. I’d get rid of some of them, but I can’t part with the ones that are left–I’ve given away boxes of books. I rarely get to the library anymore. When my kids were young we went there at least once a week. For me e-books are much more practical since I never have to worry about space in my house. :) But I understand the excitement of holding a new book in your hands. My hands just don’t like holding books anymore–it hurts. Before Kindle I would find books at libraries,library sales,and yard sales in addition to buying books to satisfy my urge to read. I”m with Kimberly and Linda. We nearly lived at the library when our kids were little. I remember bringing home full stacks of books for everyone every 2-3 weeks! Used book stores, garage sales, library sales all added many books to our keeper shelves. Our very stuffed keeper shelves. It’s only in the past few years that I’ve stopped borrowing books or buying them used. For one thing, my eyes are bad, and I can no longer read most print books. But equally important, I love my Kindle, and I’ve found my habits changing. I’m picky about downloading free or even promo-priced books, even for Kindle, because an unread backlog doesn’t do anyone any good! But when I find a new-to-me author I enjoy, I’m happy for one-click buy. So long as the e-book is reasonably priced, she’s got me for a while. Due to my time constraints, I’ve become a real lover of the audiobook. I always have my phone on me and am listening to something. I enjoy many MANY more stories each year because of that. I do enjoy browsing a good used bookstore, or book sale. The one author that I do remember discovering that was a real find, was Becky Wade. Previously I had been mostly a reader of historical inspirational fiction, but she introduced me to the world of contemporary inspirational fiction with My Stubborn Heart which I picked up at the local literacy associations book sale. I love used book sales! Our library is rather small and they do have a book sale every year. They also have a “friends of the library” section where ex- library books are marked way down ($1 a book). I’ve found a few that way. Mostly where I find used books is my local Goodwill store. Like you said here, I can rarely afford a $15 new book nor would I be willing to pay that no matter how much I want it. I’ll wait for it to come down in price on Amazon. While I adore print books & they are my first preference, I have a Kindle where I most often go for the free books or our Overdrive library system (digital books). I’ve found enough places to get my book fix way less expensive ways….and I simply can’t help browsing my local library (real or digital) for some new reads! Oh, and the first place I go when we stop at a yard sale?? You guessed it, the book section…lol!! I absolutely love book sales. I can spend so many hours there and loose track of time sometimes. In the past few years my husband and I have tried to make the extra early hour to get the beat books. It’s quite exciting but we’re usually cold and sleepy waiting in line. We usually look for books within our field first than we spend uncountable hours in the fiction section. I’m usually disappointed that they don’t have an inspirational romance area and I have to search for books in many different places. I’ve found good ones but it took me a few years to learn where to look for them. I buy a lot of books–I have spent most of my youth allowance on books and I love how i can always get more for less if i look in the right places. Growing up I was into Agatha Christie’s books and I’d buy several on book sales once a year until I couldn’t keep up with reading all I bought before next years. My husband is way more conscientious than I am in that aspect. I always think I will find time to read bit if he thinks he has many books he hasn’t yet read, he’ll not buy more. I like having and reading books. I’d like to think I’ll read all I own but at this point that’s uncertain as I continue to get new (at least new to me) books. I love reading my novels on my Kindle but I don’t mind reading the printed copy. Our local library does used book sale but I have never been one. Hopefully, I will be able to attend and take my son so he can have the experience. I love used book sales and I even volunteer at my local library for these sales. It helps the library bring educational events and new books to the library and keeps the community connected. For me it is an opportunity to find affordable books by favorite authors and try new authors. Occasionally I find a “GEM;” a book that I love but only have it on e-book or can’t afford to own it, but find a copy of it in hardback/paperback for my personal library collection. Or, my favorite…helping a child find an affordable book and watch them sit down immediately to read. What a joy! I love going to our libraries used book sale! You can never have enough books…. I love getting books period. Our library even sets out free books from time to time. Score!